Hey, wanna see my vacation photos? I’m always afraid of people asking me if I want to see their vacation photos for one reason: I have no interest in seeing 100 pictures of the same person standing and smiling in front of a monument or a landmark. I guess I have something against the very generic “I’ve been here” photos. Now that we’ve been back from our vacation for almost a week, I feel terrible not posting some pictures on this blog, but I also feel terrible if I’m making you look at my vacation photos. So I promise I won’t show you any “I’ve been here” photos. I found that traveling with a wiggly toddler makes photo-making quite difficult. I often passed on opportunities because either I was carrying Joshua, or he’s whining for me to carry him. Why did we not use a stroller? More on that later. 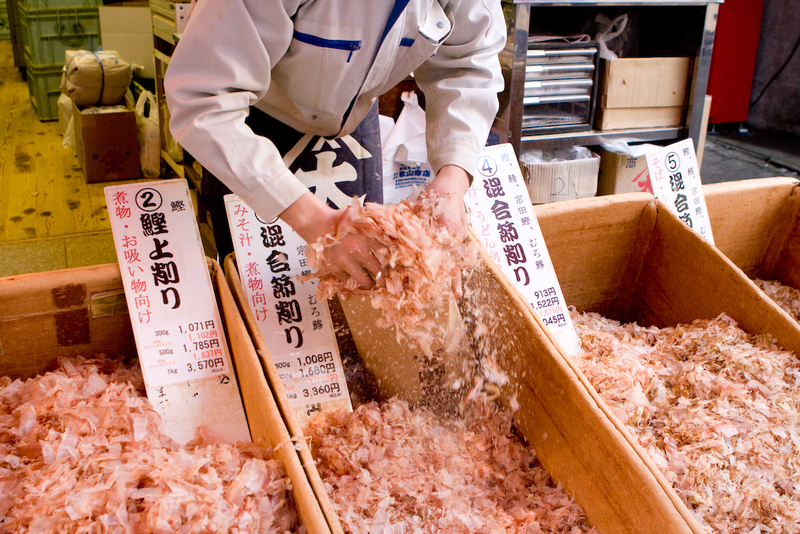 At the biggest fish market in the world, a number of shops sell these dried fish flakes called benito flakes. I’ve used benito flakes for cooking before. You can make a very quick and simple fish stock from just boiling some of the flakes. However, I’ve never seen benito flakes in this massive quantity. You usually buy a small pouch of it from the supermarket and it lasts a long time. Here, you buy it by the kilograms. This vendor sells six different types of benito flakes. When you walk by the shop, the first thing that hits your senses is the strong fragrance of the flakes. These flakes are big, not like the tiny shredded stuff you get at supermarkets. And here you have choices of which mix of fish you want. We bought a very big bag that made our entire suite case smell like fish flakes. When we visited the Meinji Temple, I wasn’t quite sure what to expect. I’m not a temple-goer, and am not familiar with the history behind this place. 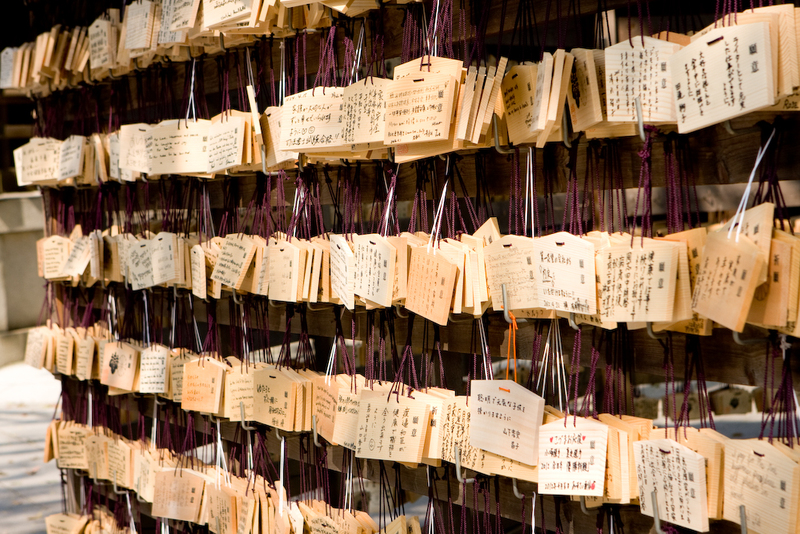 My favorite part of the visit was the big structure on which people hung their wishes and prayers. Yes, you have to pay a fee to buy one of these tablets to write on. But the reason I really liked this, is that you get to see how real people can be in their wishes and prayers. Some people asked for blessings for their families, their health, careers, exams. Some people simply asked to be happy and fulfilled. It’s like reading people’s raw emotions and what’s truly on their minds without knowing who the person is. This picture has nothing to do with our vacation, but it was taken during our vacation. Joshua was sitting next to Cliff on a bench while sharing a serving of fries at a fast food joint. I love how Joshua just loves to be with his daddy. Tokyo is a very busy place. On our first morning there, we were up so early that we thought we’d go explore the city early. Big mistake. We were caught in early morning rush hour traffic, and we could barely get on the metro. People push and shove to get on and off the metro. Sometimes a train comes into the station, and you can see the people plastered against the window of the train. They almost fall right out of the train when the door opens. I wish I had pictures of the crazy train ride that morning, but I was too busy trying to hold onto Joshua without being pushed too far from Cliff. 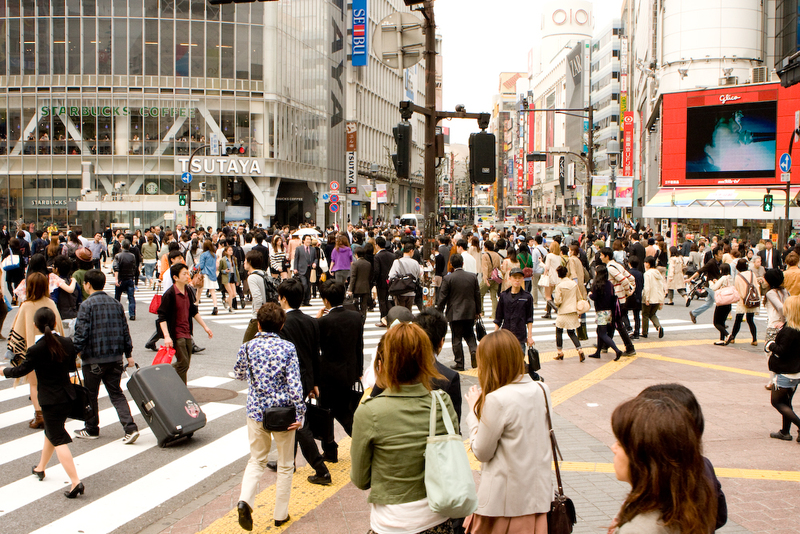 So here’s a picture of the busiest intersection in the world in Shibuya. It’s a 5-way intersection. When the light goes green for pedestrians, sometimes a thousand people rush through it. When we went, it wasn’t that busy, but you can still see from the picture that people fill up the intersection. Lastly, we also visited my parents in Taiwan on our trip. 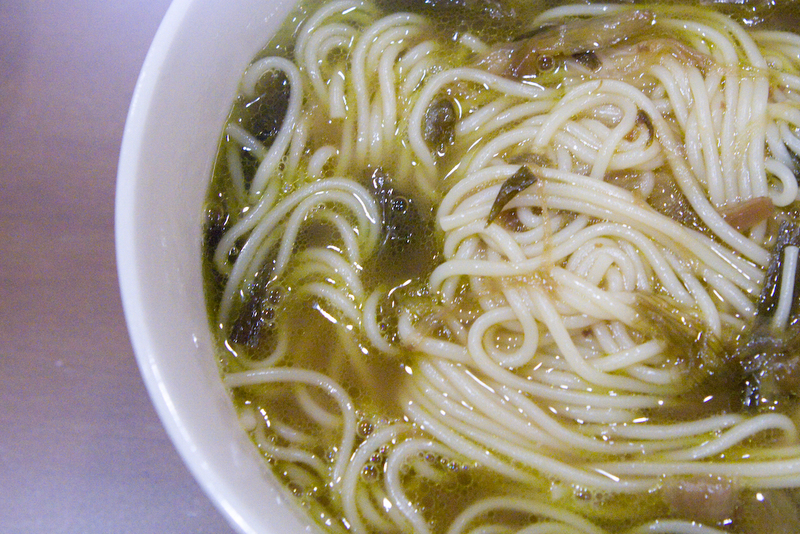 Here’s a picture of a noodle dish my dad made. It was my favorite. He fries green onion for a long time at a very low temperature until it wilts, and add dried shrimp, soy sauce, and sugar. I call it green onion confit because it preserves the green onion for a long time. Essentially it becomes a savoury topping you can put on noodles or whatever you like. It keeps in the fridge for ever! He makes the noodle in a thick, homemade chicken and ham stock, tops it with the green onion confit, and the dish is to die for. This entry was posted in Family, Photography, Travel and tagged baby, cooking, food, Japan, Joshua, photography, Shibuya, Taipei, Taiwan, toddler, Tokyo, travel by angelasaito. Bookmark the permalink. The noodle looks very delicious…I wannna eat the noodle…. Thank you, travelleader. It was definitely delicious! It’s making me feel kind of hungry right now thinking about it. Thanks for sharing us the unique combination of something nostalgic and so personal (which squeeze my heart. 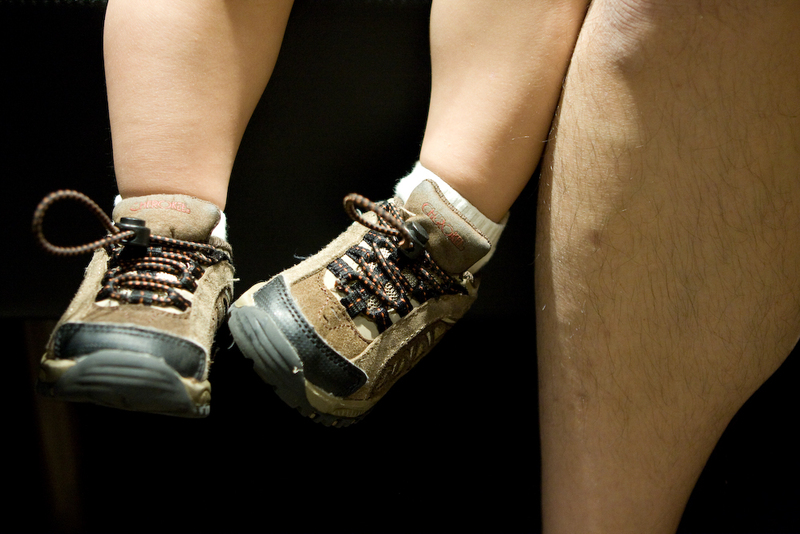 Stop the cuteness, little Joshua and hairy daddy! ;-)) I like the angle you always capture in them. Awww, thanks, Tomoko! Hope you guys are doing well! neat pictures… I want to go to Japan but Marie, not -so-much…. and especillay if she reads your blog…. she doesn’t enjoy crowds 🙂 Hope you guys had a great time.